What is the fundamental ‘substance’ of the universe? Today, the original wave-particle debate is often subsumed into quantum theory, where not only do electromagnetic waves have particle-like features, but particles also have wave-like features. In this context, accepted science might be said to have already embraced the idea that matter particles may only represent a concentration of energy, as defined by Einstein’s famous equation [E=mc2], such that the idea of material ‘substance’ has to evaporate at some level within the microscopic universe. By the same token, waves might also be generalised as energy propagating between 2 points in space-time. Therefore, in this section, we may need to start qualifying the scope and meaning of previous classical notions of physical particles, for in many ways, it becomes increasingly difficult to maintain this idea, especially at the sub-atomic level, where the substance of the particle appears to carry no real meaning. Of course, if we accept this position, we might also have to question the inference of a particle model that is still used to describe the interactions within the sub-atomic domain. In this context, the classical model of particle physics attempts to describe the building blocks that give form to the universe, although the quantum particle model subjects the original idea to much revision. However, while the diagram above may appear to be all encompassing, it only really covers about 4% of the ‘substance’ within the universe with the additional realisation that only about 0.0000000000000000000042 percent of the volume of the universe contains any matter, as we understand it. So what is the remaining 96% of the 'matter' universe made of? Well, currently there is a theoretical assumption that 22% exists in the form of dark matter, while the remaining 74% is in the form of dark energy. However, neither dark matter nor dark energy is shown on the diagram above, because the composition is essentially speculative and unknown. In the context of cosmology, dark energy is a ‘substance’ that is assumed to uniformly fill the entirety of space and to be the source of a repulsive force causing the universe to expand. When was the standard model established? However, over time, the standard model has grown to define an increasing number of particles, i.e. 200+; although most interactions are now described using only 17 fundamental particles, i.e. 6 types of quarks, 6 types of leptons, 4 types of force-carrying bosons and a hypothetical Higgs boson. However, all matter particles have associated anti-matter particles, e.g. the electron counterpart is called a positron. Within the particle model, there are four known forces carried by boson particles. The strong and weak forces essentially exist only within the atomic nucleus and bind sub-atomic particles within the atomic structure as a whole. While gravity is essentially the only force to scale to the macroscopic universe, forces such as friction and pressure, along with all electric and magnetic interactions between charged particles are due to electromagnetic forces. The electromagnetic and gravitational forces are both subject to an inverse square law of distance, which implies that these forces theoretically extend to infinity, while the strong and weak nuclear forces are essentially restricted to distances on the scale of the atom. How does the particle model align to relativity and quantum theories? The standard model is said to be consistent with both quantum mechanics and special relativity, but gravity is still excluded from this model, because the graviton force particle has never been observed. However, there is one other critical force-particle, the Higgs boson, which is still subject to questionable verification, that is critical to the description of mass within the constraint of a particle model. In this context, the Higgs boson is said to cause the interaction between particles that accounts for the effect of mass; although it does not explain why the photon has to be described as a massless force particle. The standard model is also said to align with Quantum Field Theory (QFT), which is in-turn based on the ideas contained within Quantum ElectroDynamics (QED) that is thought to explain how electrons, positrons & photons interact. 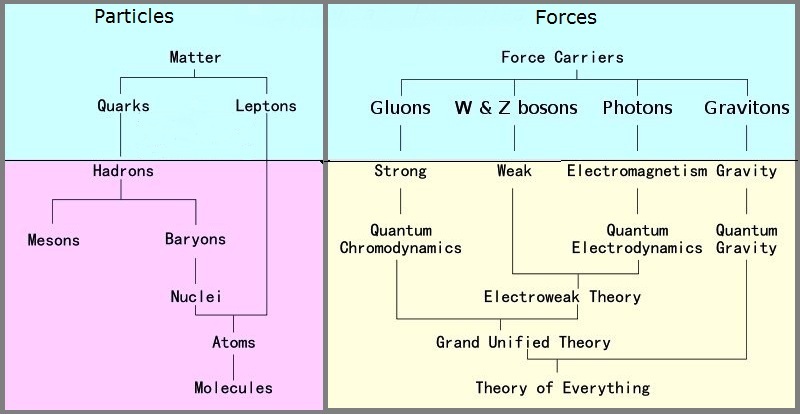 When QFT is discussed in the context of the strong force, it is associated with Quantum ChromoDynamics (QCD), which is said to explain how quarks & gluons interact to form other composite sub-atomic particles, e.g. protons and neutrons. A free neutron, i.e. outside the atomic nucleus, has a mean lifetime of ~15 minutes, before it typically decays into a proton plus electron plus an electron anti-neutrino. The decay of a proton outside of the nucleus has never been observed, but is calculated to have a mean lifetime of not less than 1036 years. OK, but what about the description of the universe as a whole? In mass terms only, about 85% of the universe is not accounted for by any of the particles in the standard model, other than a somewhat conceptual description of dark matter. According to the Big Bang theory, our universe resulted from a ‘singularity’ some 13.7 billion years ago, although the idea of the singularity itself cannot really be described by any accepted physics. Within this cosmological model, the 4 fundamental forces, as perceived today, are thought to have remained a unified force for the first 10−43 seconds, after which gravity and the strong nuclear forces separated from the other two forces. Then, after 10−12 seconds, the electromagnetic force separated from the weak nuclear force, leaving the small, but rapidly expanding universe to consist of a hot quark-gluon plasma, which included leptons and anti-particles. After 10−6 seconds, hadrons began to form, although most hadrons and anti-hadrons were eliminated by mutual annihilation, leaving only the 1/billionth residue of hadrons after the first second of existence. What does accepted science tell us about the next 13.7 billion years? Well, within the spread of a number of different variants of the Big Bang model, between 1-3 seconds after the expansion of the singularity, the universe continued with the mutual annihilation of leptons and anti-leptons until only essentially leptons remained. As a by-product of this mutual annihilation process, the universe was super-hot and dominated by photons. However, various models suggest that after some 3-20 minutes, protons and neutrons would have begun to combine to form atomic nuclei, but that the resulting plasma of electrons and nuclei, i.e. ionised hydrogen and helium, would have existed in this state for some 300,000 years until the temperature dropped to about 5000ºC. At which point, the lower energy levels would have allowed hydrogen and helium atoms formed. Note, if the amount of matter and anti-matter had been totally symmetrical, the subsequent mutual annihilation would have resulted in a universe consisting of only photons. However, current models assumed that for every billion annihilations, a single particle of matter remained, which now accounts for all the matter we see in the universe. Today, about 99% of the photons in the universe exist in the form of what is called the Cosmic Microwave Background (CMB), which is believed to be the residue energy of the mutual annihilations that took place some 13.7 billion years ago. Originally, the temperature of CMB plasma would have been measured in terms of millions of degrees, but which has now cooled to an ambient temperature that is less than 3 degrees above absolute zero. In comparison, the number of photons ever radiated by all the stars in the universe is trivial. But what level of verification exists for this model? The evidence for dark matter primarily exists in the form of gravitational anomalies, e.g. the rotation of galaxies. The scale of these anomalies suggests that dark matter has to be a dominant form of mass in the universe, which not only caused hydrogen to coalesce into stars, but became the primary binding force that holds galaxy together. In order to fit current observations, dark matter cannot interact with the electromagnetic force, which is why it is so difficult to detect outside the scope of the gravitational anomalies, which therefore remains the primary evidence for the existence of dark matter. As such, dark matter is assumed to be non-baryonic, which simply means that its composition does not align to the standard model. Some physicists continue to argue that dark matter does not exist and that science should consider the possibility that the current theory of gravitation may need to be revised in order to explain the observed gravitational anomalies. For now, it is probably fair to say that the concept of dark matter is still an unverified idea. However, it is possibly more true to say that the evidence for dark energy is even more circumspect in that its existence is based on a more tenuous observation related to the rate of expansion of the universe based primarily on redshift observations. However, the details behind this issue will be deferred to the main discussion of cosmology. While there is no shortage of alternative models, all are essentially conceptual and most suffer from a comparable lack of verifiable evidence. As such, this section will try not to confuse the status of accepted science by introducing too many ideas outside what might be called mainstream science. However, more tentative theories will be discussed in the next section entitled: Speculative Direction. As an alternative to the particle model, string theory was one attempt to describe the building blocks of the universe in terms of strings of energy rather point particles. The general goal being to try and unify relativistic quantum field theory with the theory of general relativity at the Planck scale, i.e. 10−35 metres, where Einstein's equations of general relativity essentially breakdown. However, the idea introduces much theoretical complexity, not least, being the idea that strings vibrate in ten dimensions, six of which are tightly coiled on the Planck-scale that cannot be physically verified. Such abstractions has led some scientist to highlight the dangers of hypothesis being evaluated, if not verified, solely on the basis of mathematical models, independent of any substantive verification within the physical universe. So what is the scope of accepted science? In truth, the scope of accepted science is now so enormous that it requires entire libraries dedicated to the myriads of sub-branches; each of which is considered a specialist subject in its own right, requiring years of study and training to comprehend. As such, the selection of relativity, quantum mechanics and cosmology represents little more than a litmus test of some of the issues that are intended to complement the previous discussion of the Scientific Perspective in the context of Worldviews. In order to help wider distribution and review, the web based discussion of accepted theory of science has/will been reproduced in a series of PDF file. Note: missing files will be added when and when completed. "Modern science is characterized by its ever-increasing specialization, necessitated by the enormous amount of data, the complexity of techniques and of theoretical structures within every field. Thus science is split into innumerable disciplines continually generating new sub-disciplines. In consequence, the physicist, the biologist, the psychologist and the social scientist are, so to speak, encapsulated in their private universes, and it is difficult to get word from one cocoon to the other..."